What nature vetoes, no one can accomplish. From Gaius Cornelius Gallus, in his Elegies. May we say that this is equivalent to "One who cannot pick up an ant and wants to pick up an elephant will some day see his folly"? -From George Herzog, in his Jabo Proverbs. 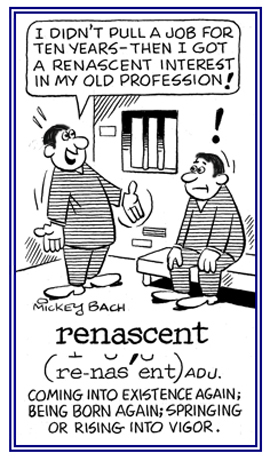 Referring to someone or something that exists, happens, or is popular again; renewed vigor; reborn: After years of having her "Nancy Drew" books in her bookcase, Edda developed a renascent interest in reading all of them again! © ALL rights are reserved. 1. Pertaining to, or being above or beyond what is natural; unexplainable by natural law or phenomena; abnormal. 2. Pertaining to, characteristic of, or attributed to God or a deity. 3. A superlative degree; preternatural: "A missile of supernatural speed. 4. A reference to, or attributed to ghosts, goblins, or other unearthly beings; eerie; occult. 7. Supernatural forces and the supernatural plane of existence: "They had a deep fear of the supernatural when they walked by the cemetery." 1. A supernatural character or agency. 2. Belief in the doctrine of supernatural or divine agency as manifested in the world, in human events, religious revelation, etc. 3. Belief in a supernatural agency that intervenes in the course of natural laws. 1. Descriptive of that which pertains to entities, events, or powers regarded as beyond nature, in that they cannot be explained by the laws of the natural world. 2. Relating to that which departs from what is considered usual or normal; especially, so as to appear to transcend the laws of nature; attributed to an invisible agent; such as, a ghost or spirit. The restorative, healing power of nature. Showing page 6 out of 6 pages of 87 main-word entries or main-word-entry groups.